Batsman Ramnaresh Sarwan has blamed West Indies for his continued absence from the national team. 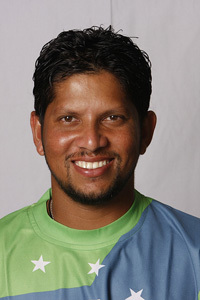 Sarwan has played 87 Test matches for West Indies, hitting almost 6,000 runs at an average of over 40. Despite his excellent record at international level, Sarwan was told by selectors in September 2010 to improve his attitude and has not featured for the Windies since July 2011. The 31-year-old admitted the saga affected his confidence and his game in general. "[The coach] said some negative stuff that hurt me mentally and emotionally," Sarwan told sport news reporters. "Mentally I was broken down, not from the stress of playing, it's just certain individuals have drained me mentally. It took a toll on my confidence and the way I play. Everything went away." Sarwan is currently playing for Leicestershire in county cricket and has enjoyed an excellent start to the season – hitting two centuries and two half centuries in the early stages of the campaign. The middle-order batsman revealed he came close to quitting the game altogether following his fallout with West Indies. "I never spoke about this because I was caught up in a shell and I used to not come out of my house for up to three days," added Sarwan. "My dad was the one to inspire me to start back playing. I was going to stop because they were getting the better of me but when I saw him break down emotionally that inspired me. "I'm thankful to (Leicestershire) for giving me the opportunity." While Sarwan is enjoying a new lease of life in the Midlands, the Windies are touring England. His experience would have been invaluable for the tourists against a potent England attack. The betting line widely tipped them to struggle and although they lost the first test, they did give England a real scare, pushing the game to the last day before the hosts prevailed. Horsey Humour, A man was quietly reading his paper when his wife sneaks up behind him and whacks him on the head with a frying pan. "Two weeks ago when I went to the races, Mary Lou was the name of one of the horses I bet on", he explains. She looks satisfied, apologizes, and goes off to do work around the house.